Most likely if the DLC keeps going. They are milking this so they'll try to touch base with every female character they can go after fro the Nanoha DLC. 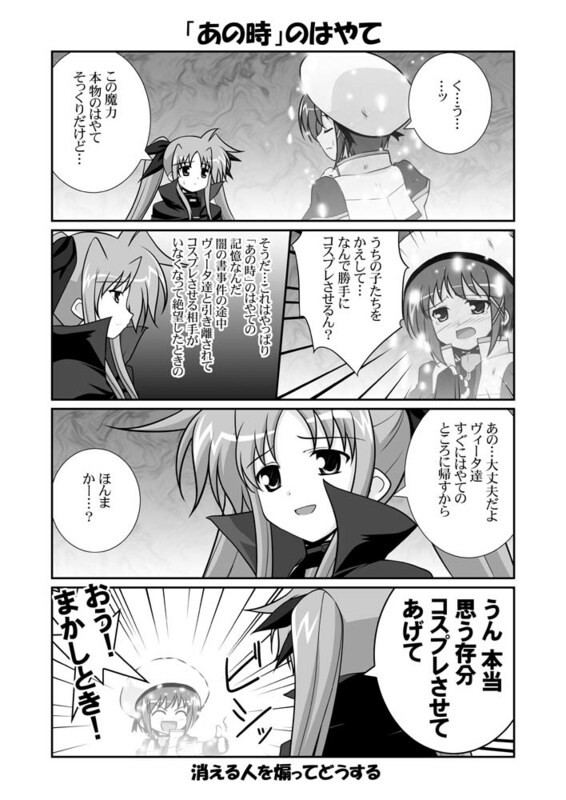 So let's see...they did Nanoha, Fate, and Hayate-chan. Coming up most likely with high degree of possibility if not just definitely: Vita and Shamal. Hopefully coming up to many is Reinforce. I can't really say since what I'm saying is just basic logical deduction. Though powers at be might milk more money off of us with a Reinforce Bind Breaker, Vinette Clock and such...wouldn't put it passed them either. then this sickening feeling should disappear! Hmm... I think I prefer "Replica". It implies something to be a near-perfect copies of the original, which the Dark Pieces are, and it has a neutral tone that doesn't carry the negative connotations of "fake/imposter". The fanchise, after all, always emphasizes that simply being a clone of someone isn't a bad thing. And yes, more help is always appreciated. Well the whole Dark Pieces → Dark → negative, so I can kind of see why Hayate22 wanted to use fake/impostor. tbh, either one is fine with me as long as it's clear that they're talking about copies. If anything, replica sounds cooler! Unknown approaching at high speed. Um, are you the real one... ? flying all alone in a place like this? Didn't we promise to have a practice match before the New Year~? I've been practising very hard. Parhaps, she is also dark peace (sic). Perhaps, she is also a Dark Piece. so I thought that she's probably one. too. It's okay, that Hayate's a Dark Piece, there's no mistaking it. It's okay. There's no mistake: that's Hayate's Dark Piece. I was able to confirm it with Hayate herself just now. A~ll right, here I go~~~! All riiight, here I go~~~! suddenly charged at me...... ! It's a dream, you're waking up. You're waking up from a dream. What, this is a dream? I thought this was weird. a match for Nanoha-chan yet. That was a good fight we had. We just had a good match. I'd love to do it properly in reality. Yeah, I'll do my best too! In that case, good night...... ? If my dream is ending, shouldn't I say good morning? I'm starting to see it at last. the reason why I use magic. -shrugs- This is why we need those fansub translators and checkers. They can actually do this better than several amateurs like us who just started for a short while. Oh well, we're trying, right? Well, the DLC is a money maker for them because of all of us DLC people. ONORE LVD!!!!! I WAS SUPPOSED TO GET THE FIRST SHOT AT THE TRANSLATION CHECK!!!! Speaking of Signum, I actually completed her storyline the Sunday of last week (before my Spring Break) and well...those of us that remember the last episode of A's...I'm not going to say much except for one thing. If you recall about her and Fate having to settle their match well...*points below to spoiler*. yeah well...the whole settling their match was also implied that they would do it over and over again, fair and square. It won't be settled that fast...-shrugs- Plus I think many of us who have the game already already played through Signum's story already. Anyway, this game is a bit evil...it forces us to hurt our favorite characters from time to time. Would that include Chrono, for the girls? Thanks MAEt for the av! Fate vs Dark Piece Fate made me lol at the emo levels. I'm female myself and, well, stuff. 8D My friends don't mind my erojiji leaking out toward 2D girls — they actually think it's refreshing, rofl. Well, the seiyuu for Zafira does eroge, as do most guys.... and BL stuff, so.... I think someone recently uploaded an eroge voice pack of Ichijou Kazuya somewhere, lol. Security to the bridge and prepare a straitjacket. I think a certain sword might go berserk. Actually, if I go to an upcoming convention, I should bring my PSP along and see what my mates think of the DLC. tbh, I'm more curious what they guys would think, since I've had to explain what zettai ryouiki and dfc are to them. But back to the game scripts and translations! Maybe I should ever so slowly try writing out the script for one of the simpler not Hayate or Reinforce routes. I was thinking of Zafira or Vita. See this? The guy on the left is Ichijou Kazuya's character. Oh, that dood on the right? That's Narita Ken's character, aka Jail Spaghetti. So basically, we have Zafira x Jail right there~ The game is called Kimi no Naka no Palladium. My friends don't mind my erojiji leaking out toward 2D girls — they actually think it's refreshing, rofl. Ahhh, the reactions of people that find out I'm not a guy are always amusing. 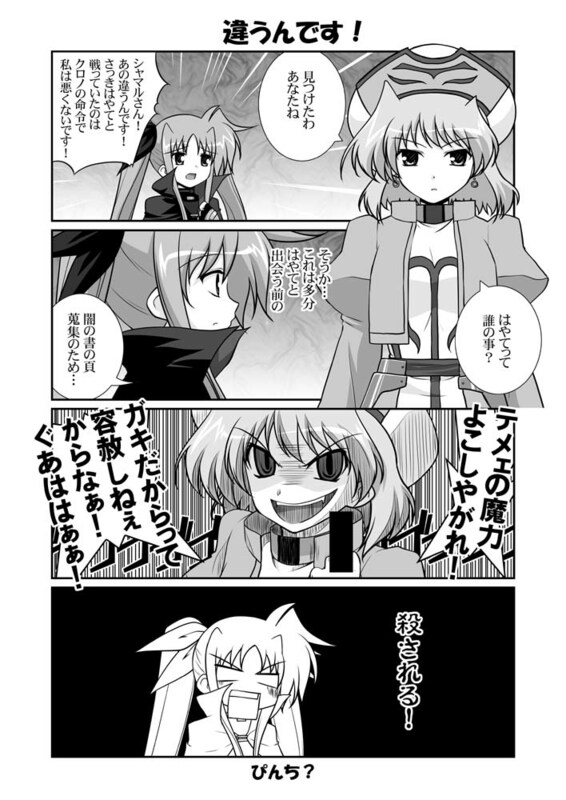 4koma dood did a little more of Fate Story Mode. Let's just say, I'm never looking at Dark Piece Shamal the same way again. Help with corrections are appreciated. On the post-fight chatter, <Version A> is the what appears if you won the second round with little or no damage, <Version B> is the what apears if you won the match with a decent amount of damage, and <Version C> is what appears if you won the match when your health is at critical. However, it's already too late...... the rampage of the Book of Darkness will not be stopped. It will revive no matter how many times you destroy it. You know... Book of Darkness-san. You're going through a bad dream right now. a kind master and a warm family. Such a thing could never be. Have you ever imagined just how much I have suffered? No, it's fine with me. The ones without sins are my earnest and kind knights. have been killed by my curse......! I am the Book of Darkness, the cursed tome. This body will start to go out of control soon! Your night had already ended. Enough already with your lies......! I said remove yourself from there! cursed Book of Darkness anymore! the long night is already over. no longer the Book of Darkness. It happened... It was a chance encounter! and she's both kind and strong. she greatly values you as well! for some reason, your words carry conviction. "Good morning" to you with a smile. Everyone out there, it's an emergency......! The Dark Pieces are gathering in a cluster!! in the skies above the sea! please let me go there myself. I think I've found it at last. According to this,the next DLC comes out on April 27.
hello all, I was curious as to who owned the special additon of Battle of the Aces. I'm thinking of picking up a copy of play-asia, but I dunno if I should wait and save up for the special addition or just go for the normal addition. Thanks a lot for the translation. I don't have a PSP but it is still interesting to read the story. I know just how much I had suffered. Maybe it is a question? Like, "Do you ever know how much I have suffered?" Many thanks again. Even non-gamers like me really appreciate your work. "Have you ever imagined just how much I have suffered?" I do not like Kansai-ben, but I do like Hayate-chan! Also, Canadian here, not actually Japanese. - Totally not using the subs from second episode of A's at all. The one's without sins are my earnest and kind knights. have been killed by my curse...... ! - Er, I feel like if we use Queen, we'd have to change Master to Mistress. Or maybe I'm just so used to Master? I am the Book of Darkness — the cursed tome. Remove yourself from there...... ! Your night has already ended. Enough already with your lies...... ! - Er, if we changed "fuu" to "sigh", then this could be changed to panting, right? for some reason, your words sound authentic. Everyone out there, it's an emergency...... ! WHERE IS MY NANOHA DLC DAMMIT. I've been told that school uniform figma Nanoha can pay the Lyrical Box itself if you decide to sell her off, which sounds pretty awesome. If you're interested in the various things in the box like the Nanoha DLC dammitdammitdammit, it's a pretty good buy. It really depends on how much you want/like Nanoha merch. I'm confused. I bought the Lyrical Box awhile ago but didn't realize there was a DLC thing. Where's this DLC thing? How do I find it? Where do I go? 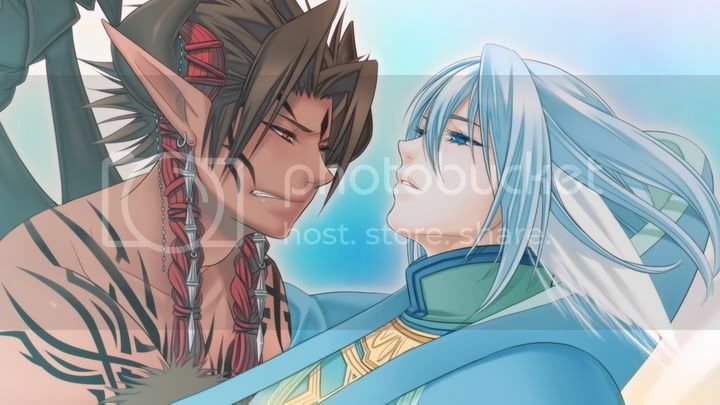 Except for the pictures in the artbook, I'm not even sure what it is.